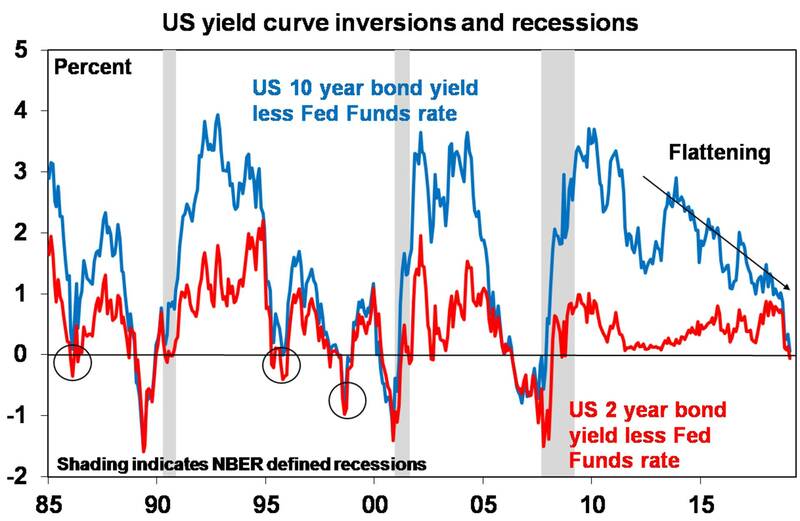 But what about the flat/inverted US yield curve? The collapse in bond yields though is now causing much consternation that a flattening or inversion of the yield curve in the US may be signalling a US recession. An inverted US yield curve – i.e. when long-term bond yields fall below short-term rates – has preceded US recessions so it’s natural for investors to be concerned. 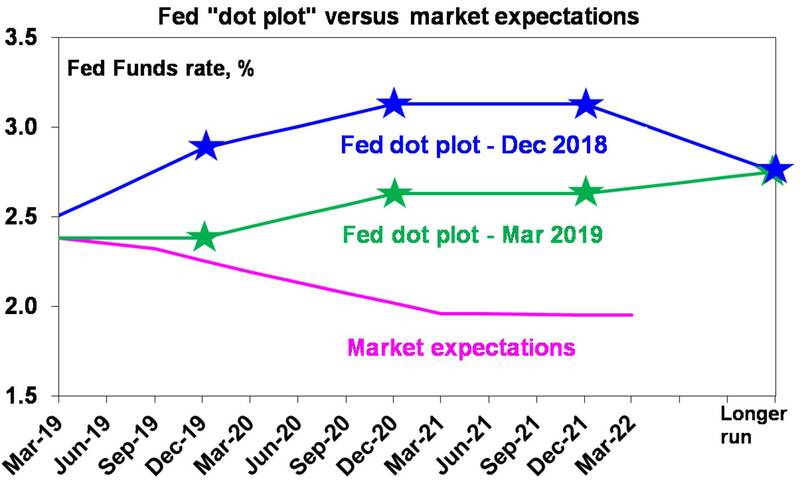 Last week saw the gap between the 10-year bond yield and the 2-year bond yield fall to just 0.12%, the gap between the 10-year bond yield and the Fed Funds rate fall to just 0.06% and the gap between the 2-year bond yield and the Fed Funds rate fall to -0.06%. The Brexit comedy rolls on with the European Union giving PM May until April 12 to get her Brexit plan passed through the UK parliament on a third go (probably in the next week) or to seek a longer extension. While pressure on Brexiteers to support the deal is now intense it’s far from assured that it will receive parliamentary support. If it doesn’t, then the EU – not wanting to be blamed for a no deal Brexit – will likely accept a request for a longer extension, but it would probably be conditional on the UK voting in EU parliamentary elections in May, and it would likely mean that the whole thing could drag on for another year! Our view remains that a soft Brexit or no Brexit remains most likely but it’s a long way from being resolved. Because 46% of UK exports go to the EU but only 6% of EU exports go to the UK Brexit means far more for the UK economy that it does to the EU! What happens in the Eurozone is far more significant to us as investors than Brexit. Why will limiting negative gearing and halving the capital gains tax discount push up rents and push down property prices? Several studies have looked at this issue with similar conclusions since it became part of Labor Party policy in 2016. The answer is quite simple. If negative gearing is limited and capital gains tax increased then investors will demand a higher pre tax return to invest in property. Looked at in rental yield terms (ie annual rents divided by prices) SQM Research – after examining international comparisons, what the tax changes would mean financially to taxpayers and the 1985-87 experience when negative gearing was briefly removed – estimate that rental yields are likely to rise around 1 percentage point over a 2-3 year period if the tax changes are made. This would occur via less investor demand in the property market causing some combination of lower property prices and rising rents (partly due to less property construction) until it becomes attractive to invest in property again. On their estimates average capital city property prices would fall 4% to 8% (but fall 7% to 12% in Sydney and fall 8% to 13% in Melbourne) and rents rise 7% to 12% in response over 3 years. Now this assumes two interest rates cuts and if that doesn’t occur the estimated fall in property prices is 5% to 12% relative to what otherwise would have occurred. A study last year by Riskwise Property Research and Wargent Advisory reached similar conclusions in terms of prices. Of course other things could reduce this impact like a new first home owners grant scheme and if rental yields have already increased anyway. Would property investors rush into the market ahead of the changes if they are confirmed so they can be grandfathered? Maybe. But they may also decide not to because they would worry that their investment property will be worth less once the tax changes occur. 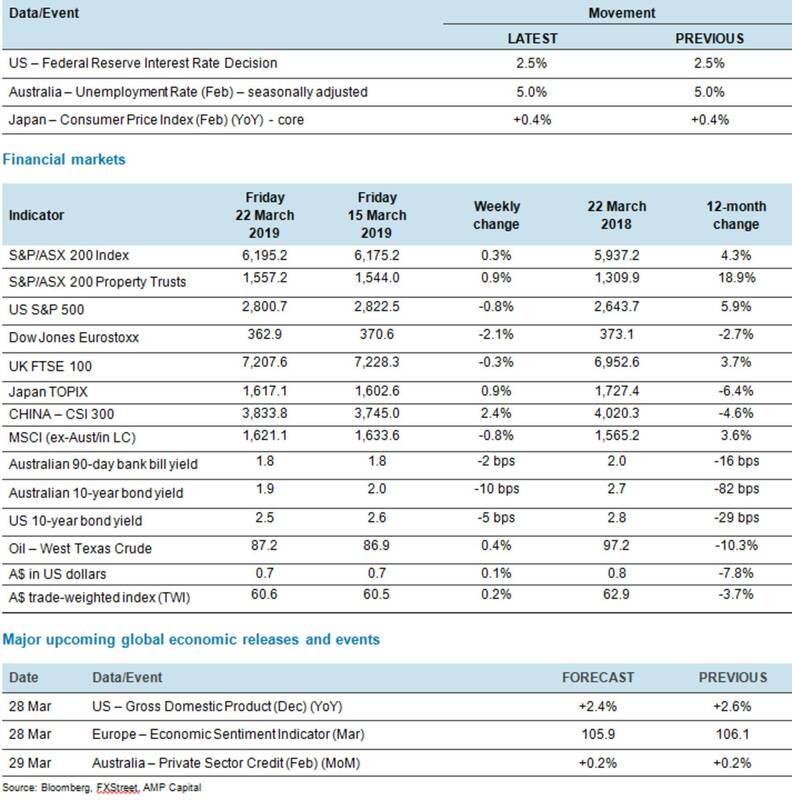 Regardless of the merits of such changes (for the record I think there is a strong case to reduce the capital gains tax discount but am less sure about the proposed change to negative gearing), this issue is another drag on the residential property price outlook.